There was never any question as to where we would honeymoon. It may seem cliché or overdone, but when neither person has ever been to Hawaii, what better excuse do you need than a honeymoon? We booked a 10-day journey in August of 2010 that took us to two islands, Oahu and Maui. We flew from Washington, DC to LAX and then onto Honolulu International airport. We spent the first four days of our honeymoon on the island of Oahu, staying at Waikiki Beach, near the capital city of Honolulu. We used this first stop on Oahu as a chance to recover from the two long flights before island jumping to Maui for the second half of our journey together. The pilot on our United Airlines flight from Dulles came on the loud speaker and said, “Attention airline passengers, today we are joined by Mr. & Mrs. Toner who are celebrating their recent wedding and headed to Hawaii on their honeymoon!” The entire airplane erupted in applause and cheered as if they had attended our wedding reception. A moment later our flight attendant came over to personally congratulate us and asked if we preferred red or white wine? The pilot had offered to buy us a bottle of wine! This would later be a lifesaver when we started to get antsy on the second flight from Los Angeles to Honolulu. The moment we walked through the doors you could feel the old Hawaiian charm with the amenities of a modern day luxury resort. Although we didn’t go for the Vera Wang suite, our room was spaciously designed with floor to ceiling white sliding blinds that allowed for complete openness or quiet calmness throughout the day or night. From our personal lanai, we overlooked the famously designed oval orchid pool. Plus, in the distance, the extinct and picturesque volcano nestled into the waters of Waikiki Beach. We dropped our bags and popped a bottle of champagne in the room before taking a quick dip in the ocean to help unwind from the long trip. For our first night, our friends arranged for a romantic dinner at Orchids as part of our Traveler’s Joy “Night on the Town” gift. The meal was spectacular! We enjoyed fresh Ahi Tuna with our first Hawaiian Mai Tai. The chef personally came out to congratulate us and we really felt welcomed as we settled into our island paradise. They call it the Aloha spirit – the friendly feeling and positive attitude among the people of the Hawaiian Islands. From the moment we arrived and were greeted with leis, we understood this feeling of Aloha. The Hawaiian people have an unmatched appreciation for the land and for comroderity among people and for a connection between the head and the heart within each person. After enjoying breakfast in our room the first morning, we loaded up our backpack for a long walk around town and to help orient ourselves. We started on the beach passing the surf lessons kiosks, the parrot man and the famous Hilton Hawaiian Village where we did a little shopping and wandered around the property. We stumbled upon the Hilton Lagoon and took a detour to walk along the crystal blue water and palm trees. We made our way to Ala Moana, an open-air mecca of high-end fashion with Harry Winston, Chanel and of course “J. Crew on the Island,” where we stopped to make some friends with Ashleigh’s Hawaiian colleagues and were once again surrounded with the friendliness of the Aloha spirit. For lunch, we spotted a little sushi restruarunt just outside the mall and thus solidified our hunt for the perfect Ahi Poke dish. After a day of walking and shopping, we made our way back to the Halekulani where we found another bottle of champagne and nice note from our housekeeper welcoming us and offering a token of congratulations. We ate dinner the second night while watching the sunset along Waikiki and listened to some live music before calling it a night. The essence of our experience and the way we were treated in Hawaii is quite easily described as spirit of Aloha. On day three, we rented a car from the hotel and headed up Highway 2 towards the North Shore of Oahu, making our way to Skydive Hawaii for what would be one of the highlights of our Travelers Joy honeymoon! On the drive there the clouds looked grey over the mountain ridge, but before we knew it we were driving though winding hills and beautiful pineapple groves. We arrived at Dillingham Airfield and starting signing legal forms before suiting up for our jump. 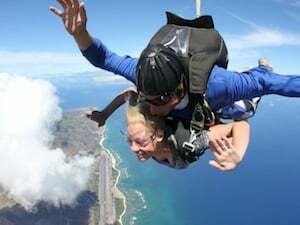 On the ride up in the airplane, Ashleigh was a little nervous – although she never doubted – and was poised to jump out of the airplane for what proved to be one of the most amazing views of Hawaii. Michael jumped first and made sure to keep an eye on his wife as she fell over the mountains and water. Skydiving is an exhilarating experience and was one of the most talked-about items on our Traveler’s Joy registry. We even made a reference on our registry site under the description of the gift of “Skydiving” that we would actually go skydiving if someone chose to purchase the $300 item from the options. One of our guests bought it and we held our promise. After skydiving, we took a ride into a nearby surf town and found a little diner with amazing Mahi Mahi fish tacos. There were a few small shops and Ashleigh found some local shops to begin the hunt for souvenirs and handcrafted keepsakes. We kept driving along the north coast until we reached Sunset Beach where we made it a point to relax for a few hours. The sand had amazing bits of grain and was seemingly ground-up and washed smooth over time from beautiful white shells. Michael was a little disappointed that we weren’t able to see any of the big bonsai pipeline waves, which apparently only arrive during the winter months. On the drive back to Waikiki we made a stop at the Dole Pineapple factory and decided that we needed to ship some fresh pineapples back to our families in Virginia – a great idea to diverge from the standard postcard. We were lucky that a family friend of ours lives and works in Hawaii. We met Mailyn for breakfast on Thursday morning and chatted about our wedding and Hawaii and life in general. She helped us to understand the Aloha spirit and the pride Hawaiians take in the land and the water. Following breakfast, we took a dip in the beautiful and famous oval orchid pool at the Halekulani. It was such a relaxing day. For dinner, we went across the street to Roy’s where we ate some sushi, scallops and seasoned edamae along with a few cocktails before heading over to the Lewer’s Lounge where we were greeted with a piano and stand-up bass Jazz duo. On our last day in Oahu, we checked out and mailed some postcards before relaxing at the pool before our 4 PM flight to Maui. The Island Air gate was minimal and flight itself was only 30 minutes. The flight attendant gave a bit of a tour of the islands as we flew over. Once in Maui, we caught a taxi to the Westin Kaanapali Beach Resort on West Maui. We spent the first evening exploring the resort, and sampling our next wave of Ahi Tuna at Oceans on the resort for dinner. We woke up on day six in Maui for the second leg of our Hawaiian honeymoon. We relaxed in the sun down by the ocean and the pool for most of the morning. I was able to do a little snorkeling right off the beach and see some smaller fish and beautiful underwater plant life. After lunch we made our first trip of many into the town of Lahania. We walked all along Front Street popping into the little shops as we made our way to Banyan Park with the most fascinating tree we had ever seen. The tree roots hang from its own branches, which overtime, have become a network of load-bearing roots for the tree itself. There were all kinds of artists and jewelry, craft vendors and live music all under the one massive tree. We ended our day with a happy hour at a local bar and restaurant, Longhi’s, where we were able to enjoy our first Maui sunset. On Monday, we got an early start as we headed over to National Car Rental to pick up our Jeep Wrangler and then make our way along the coastline on the Road to Hana. We opted to skip the bike ride originally listed on our Traveler Joy registry and instead used the money to keep the Jeep for an extra day. This was an amazing ride up and down cliffs, around hairpin turns, one-lane bridges, narrow passages and un-paved roads. We took our time as we approached each little town. One of the best lunches was at a little stop on the way called “Café O Lei.” We also found one of the best fruit smoothies along the roadside stands as well as some delicious banana nut bread. We deviated from the Road to Hana, as our final destination on this outing was the 10,000-foot extinct volcano, Mt. Haleakala. The red dirt covered much of the drive as we wound our way up. Every time we thought we were almost there, there was another level and another curve to climb. At the top, the view into the crater was unbelievable. The trails along the inside of the volcano seemed so close until we caught a glimpse of a hiker way off in the distance. 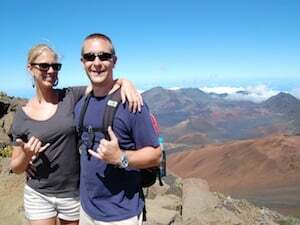 We hiked around the summit before making our way back to West Maui. For a one-day adventure, we drove about 180 miles and ended our day at the Maui Brewing Company for some local beers. On the second day of our Maui adventure, we started out heading NW again, but today our final destination was the Seven Pools, which are clear across the island on the east coast. We packed a picnic so that we could stay and enjoy the cascading waterfalls. The seven little reservoirs cascade down one into the other before pouring directly into the Pacific Ocean. We were able to hike into the falls and take a swim in the third fall. We could see the cliffs, the mountain, the other falls and the big blue ocean in one sweeping view. The rocks and waves made for a spectacular sight. The last two days on Maui were very relaxing as we just hung out on the beach and enjoyed the peace and quiet of paradise, the sunsets and each other’s company. Maui has a much different pace of life and is much less commercial than we experienced on the island of Oahu. What an amazing journey. Everything from exploring the North Shore, to skydiving, driving with the top down on the jeep, the black sand beaches, the breathtaking views and the joy of each other’s company as we celebrated our new lives together. Through Traveler's Joy, our friends and family gifted us $2,600. Combined with the $3,000 we saved, we were able to enjoy 10 days, flights and food in Hawaii – and we spent every penny. 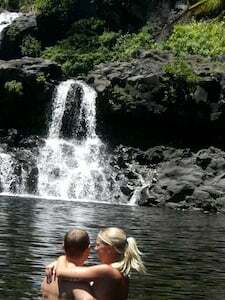 Hawaii is an expensive destination, but we loved the spirit of the island and the experience of a true paradise. There is something special about any destination when you feel a connection to the people and the land surrounding you and you walk away with a new way of seeing things. Hawaii is the closest thing to paradise we’ve ever experienced. We both concurred it was worth every penny.